1. Advanced Technology : Adopting the newest LCD pressure-sensitive technology, this version of colorful screen has been widely praised. It's a simple alternative to pen and paper. You can use attached stylus or other plastic pens even nails to write and draw, just like writing on the paper. 2. 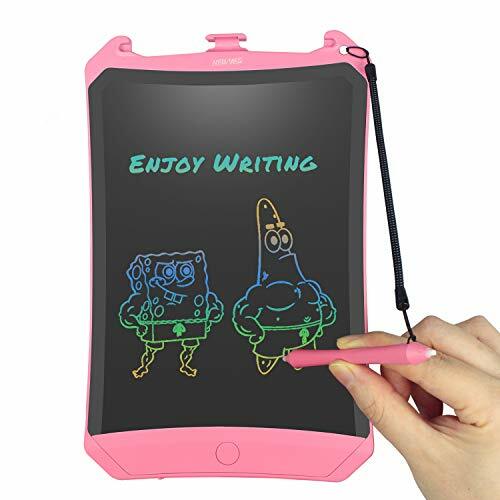 Environment and Money Saver: You don't need to waste money on papers, pencils or erasers anymore, one writing tablet can repeat 100,000 times; inside battery can be used at least 6 months, super low energy consumption. 3. Thoughtful Combination: This product is equipped with a pen slot, you can store the pen in the slot in case of lost. Besides, you can tie the pen and the pad with the free lanyard, definitely no pen lost anymore. Meanwhile the integrated magnets allow for easy mounting to compatible surfaces. 4. A Big Hit Gadget: It's suitable for anyone, kids, students, officers, housewives in anywhere, it's also nice to left-handed person. 5. Package & Warranty: LCD writing tablet*1, writing stylus*1, battery inside *1, lanyard*1, magnet*2, user manual*1 and decent package box*1, Warranty for 1 year.